But the things are not so sweet here.....how do you fancy "recrystallized-emerald" versus a "synthetic-emerald"? What if you, as a consumer, have been offered a product stating something like, "recrystallized using a natural rough from xyz source"? Is the description not romantic enough to lure you? Or how about "xyz- created emerald", "laboratory-created emerald", "laboratory-grown emerald", "cultured emerald" or just "grown emerald"? Which one will you prefer? What is the difference? The only difference lies in the NAME. In gem industry, slight variation or better say, 'mystification' of the terminology has proved to be a great marketing tool. The terms "recrystallized", "created" or "grown" are considered to be far superior to "synthetic". It is like romancing a synthetic gem through confusion. But the fact remains - a man-made is a man-made, by whatever name it is called by. Thousands of carats of man-made gemstones enter the global market every year, and confusion over the term 'synthetic' still exists –at retail as well as supplier level – and the issue remains controversial. California, USA based producer, Chatham describes their product as "Chatham Created (Stone Name)", which sounds clear, but the tagline reads, "Culturing to Perfection", which induces a debate. Ashes to Diamonds! 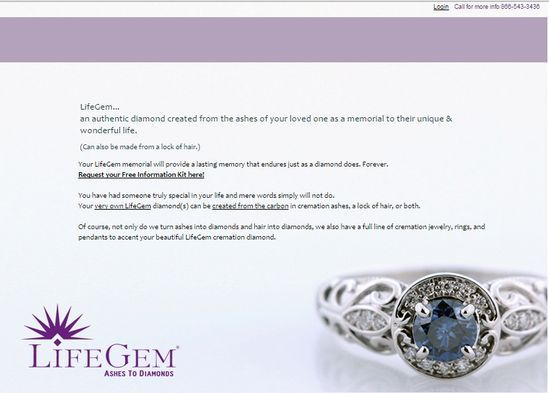 An authentic diamond can be made from the ashes of your loved one as a memorial to their unique & wonderful life.....your very own LifeGem diamond(s) can be created from the carbon in cremation ashes, a lock of hair or both....this is what Chicago, Illinois (USA) based LifeGem claims. Sounds really touchy, isn't it? 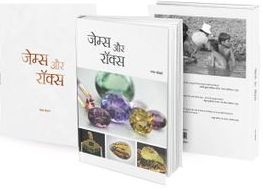 This issue of nomenclature has been debated in many CIBJO congresses in the past, where the natural gemstone dealers and gemmologists insist on the use of term 'synthetic', while the manufacturers of these synthetics do not want to use this and persisting with terms such as 'man-made', 'created', 'cultured' and likewise. Synthetic refers to an exact copy of a natural gem - made by man, with similar chemical and physical structure resulting in similar optical and physical properties. However, this term has another meaning in other industries or in general English, which denotes a product that is an artificial or fake – something that merely imitates the original. While there are also the misnomers....many man-made products or simulants such as synthetic moissanite, cubic zirconia, etc are described and misunderstood as synthetic diamond. 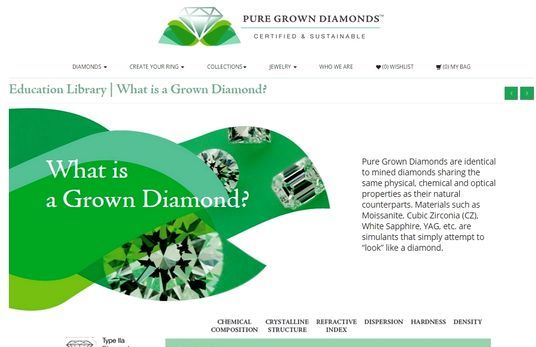 Considering the above facts and definition of the term 'synthetic', given in a standard English dictionary, how many consumers will understand 'synthetic ruby' or 'synthetic emerald' or 'synthetic diamond' correctly? Therefore, we have to admit that the term 'synthetic' is a bit confusing not only for a fair-minded consumer but also to those who are in supply chain. In other industries, where the terms like 'synthetic cloth' or 'synthetic leather' are extensively used, have only little relation to the real thing....they do not have the chemical, optical or physical properties similar to the real product. Hence, the term 'synthetic' represents two different meanings for'synthetic leather' and for a 'synthetic diamond' or 'synthetic emerald'. 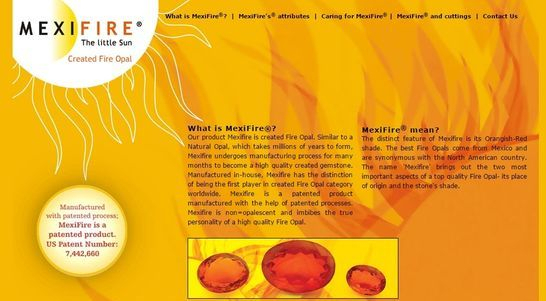 It is therefore understandable that growers of these synthetic gemstones do not want to use the term 'synthetic'. On the other hand, the gem dealers of natural gems advocate for the use of the term 'synthetic', so that the natural gems stand out from the man-made or lab-grown products. The term is however, also used by scientists, gemmologists, producers of non-gem quality (or industrial) grade materials such as diamond, quartz, corundum, etc or by those who are against the lab-grown products. So, what's wrong with the terms - 'laboratory-grown', 'xyz-created', 'laboratory-created', 'man-made' and likewise. The answer is - nothing wrong. All these terms can be used, as far as, they do not confuse the general consumer or public. 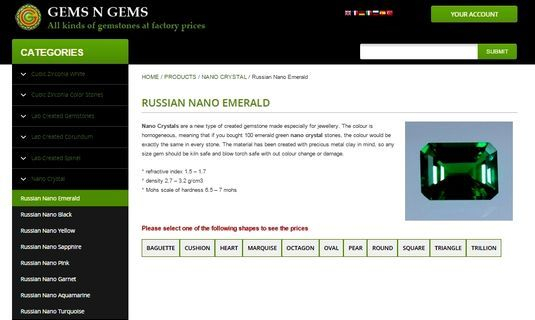 Using the descriptor 'laboratory-grown' or 'man-made' emerald works okay, but 'laboratory-grown emerald simulant' or 'man-made emerald simulant' is too far-fetched and only adds to the confusion, such as that illustrated in the following example of a green glass, being marketed as 'Russian Nano Emerald'; similar term is also used for aquamarine, garnet, sapphire, turquoise, etc. In all these cases, the name of gemstones infers nothing more than the visual appearance. Similarly, there are many artificial products which are marketed with such fancy confusing names. Then, what about the fancy claims, such as, "Using the natural Colombian Emerald rough of very fine colour, but with heavy inclusions, we remove most of the inclusions from the rough and recrystallize it after which it is cut, polished and diamond coating is done on RECRYSTALLIZED EMERALD". Isn't it sounds interesting! 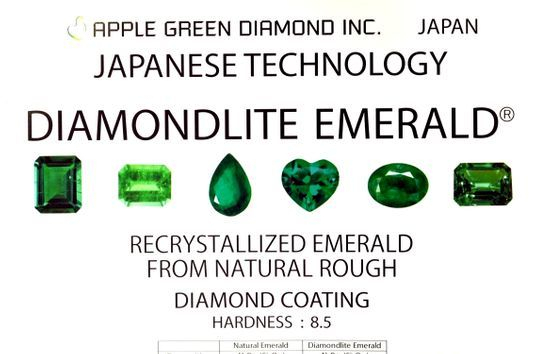 It does not end here, this material is further claimed to be 'diamond coated' which gives the emerald 'diamond-like shine' with hardness of 8 -8.5. As per my knowledge, (a) it is almost impossible to grow or control the growth of a crystal with so many inclusions / impurities present in the melt, (b) for every growth process, the feed has to be purified, (c) once the feed turns into melt, it homogenizes to form a crystal and (d) it does not matter whether the major feed (beryllium oxide, aluminium oxide, silica) used is taken from emerald (beryl) from Colombia or a chrysoberyl (beryllium aluminium oxide) + silica (may be in the form of crushed quartz) from any location. A crystal will only form when the melt is homogenized and stabilised at required temperature pressure conditions. Anyway, this will technically be described as 'synthetic emerald'. Over the years, while interacting with general consumers and novices in the industry, I have found the term 'man-made' most convenient and simple to make them understand, what a 'synthetic gem' is. However, this term should strictly be used only for the materials with natural counterparts, such as, 'man-made ruby', 'man-made emerald' or 'man-made diamond'. Using the term 'man-made' with other artificial products such as moissanite, cubic zirconia, YAG, etc will again create confusion and hence should be avoided in those cases. Prefixing company's name with the stone name such as, 'Chatham-created ruby' can also work, but only till a point when everyone in the supply chain follows the description strictly. 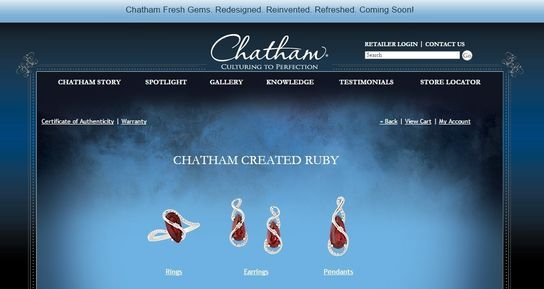 What if I receive a 'Chatham-created ruby' as an unknown specimen for identification? Can I describe (with absolute surety) an unknown specimen as 'Chatham-created ruby', without knowing its history or supply chain? The answer is probably NO! Therefore, I would prefer using the term 'man-made' or 'synthetic' or 'laboratory-grown' in such cases. CIBJO - The World Jewellery Confederation emphasizes in its blue books, the use of the term 'synthetic' prefixed to the name of its naturally occurring counterpart, e.g. synthetic emerald. However, it also allows using the terms, 'laboratory-grown' or 'laboratory created' along with using manufacturer's name in the form of '(name) synthetic emerald' or 'synthetic emerald by (name). The blue books can be downloaded at www.cibjo.org. So, what's in name....be it a 'synthetic' or 'laboratory-grown' or 'laboratory-created' or 'xyz-created' or 'man-made'.....ALL ARE SAME. It is like romancing the product through its description, which is not a bad thing, until it creates confusion for an average consumer or those in the supply chain.